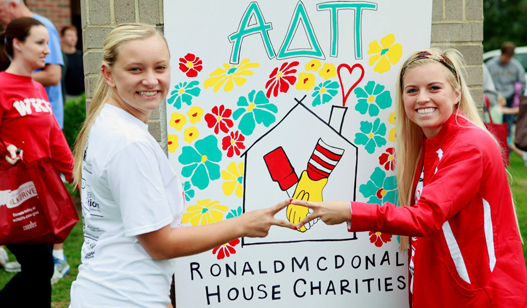 Since 1979, Alpha Delta Pi has been committed to serving Ronald McDonald House Charities (RMHC). Over the course of our partnership, Alpha Delta Pi has contributed more than $8.9 million to this worthwhile cause. RMHC supports Ronald McDonald Houses, Care Mobiles, and Ronald McDonald Family Rooms in local communities and also funds grants to other nonprofit organizations whose programs focus on children in need. Today, more than 300 Ronald McDonald Houses in 52 countries help keep families with seriously ill or injured children together when they need it most by offering them a comfortable, temporary residence in proximity to a medical facility. In addition to donating money to this worthwhile cause, many Alpha Delta Pi collegiate chapters and alumnae associations spend their time and energy volunteering at these houses. For more information about Ronald McDonald House Charities, please visit the RMHC website at www.rmhc.org. The mission of the Alpha Delta Pi Foundation, Inc. is to provide essential resources for Alpha Delta Pi Sorority’s educational, leadership and philanthropic activities which improve the lives of women and the communities they serve.